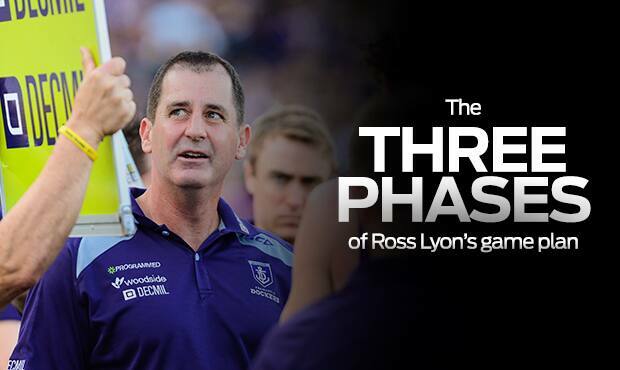 Ross Lyon’s ‘game plan’ has been a trending topic in the AFL since the senior coach first deployed his tactics on an unsuspecting football world back in 2007, when he took over St Kilda. Strangulation, suffocation and asphyxiation are all terms to have been associated with his style of play. Gold Coast coach Guy McKenna even likened it to a boa constrictor – a large species of snake that uses its body to squeeze the life out of its prey. Lyon’s current side Fremantle have conceded the fewest points in the AFL after nine rounds in 2013, and the second least in 2012. St Kilda conceded a whopping 367 fewer points than the next best defence in its 2009grand final year under Lyon, and was again the best in 2010. So what’s the big secret behind the tactics that have made team after team feel as though they’re playing the game in a phone-box? The answer is there is no secret. It’s all quite simple, really. Lyon’s game plan was influenced by a legendary, four-time premiership winning-coach. “I’m a fan of the Allan Jeans ‘three phases’,” he told Channel 7 in his weekly segment on Tuesday night. “You get to use the ball. Sounds easy in theory. Execution? Not so much. It’s the ‘getting the ball back’ part that brings the best out of Lyon the tactician. He demands great effort from his players, who tirelessly act as human compactors to put a constant squeeze on the opposition ball carrier. At times, Fremantle look like a giant purple tsunami converging towards its helpless target. “The players do it all,” Lyon said. “We give them an opportunity and a framework and they go out and lead the way.